Of all the hundreds of thousands of cliff dwellings in the American Southwest, the finest is Cliff Palace. The crown jewel of Mesa Verde National Park, Cliff Palace also happens to be the largest cliff dwelling in North America. Visitors can view the complex from the canyon rim above, but an up-close visit requires joining a Ranger guided tour. During our recent visit, we took the guided tour and definitely walked away with a great experience! Here’s how it happened. Per instructions upon buying our tickets, we arrived at the Cliff Palace overlook 15 minutes before 5:00pm, our tour start time. A paved path from the parking lot leads down to a set of stairs. At the bottom is the viewpoint, replete with railings, with a classic view down Cliff Canyon. Our tour is to be nearly full, numbering 50 visitors, most of which are gathered at the railing. The view of Cliff Palace from the public overlook on the canyon rim. There isn’t much free space, and I wait a moment for a spot to open up. I’ve seen many a cliff dwelling in my day, but this one is impressively large, as advertised! The complex is tucked into an alcove, a water-carved hole, almost a shallow cave created by Mother Nature herself. Stone walls and towers rise up from the alcove floor, some three stories in height, built by ancient people long before American settlers, or even Spanish explorers, came across this land. There is a group of about 30 people moving about the ruin itself: people on a tour. That will be us soon enough. He then leads us over to a stone staircase that drops over the edge of the canyon rim. My wife, Melissa, and I happen to be at the front of the line. He turns to Melissa and instructs her to lead everyone in. We will find a seat on the stone platform by the sign just outside the ruin. We head down a stairway carved into the sandstone, following the notches that create natural corridors to descend. A cement pathway then leads across the hillside toward the cliff dwelling. A small cliff dwelling visible across canyon during the short descent to Cliff Palace. As we walk, we peer through the trees. A small cliff dwelling is visible directly across canyon, tucked up in the sandstone cliffs. Mesa Verde really is a hotbed for Pueblo culture! We soon arrive the sign, which directs us to wait here for the ranger. We find a seat as the rest of group starts filtering in with us. A dramatic view of Cliff Palace is set out before us! We are sitting in the shade under the protection in the alcove, under a sandstone roof that provided protection to the Ancestral Puebloan People over 800 years ago. Ranger Aragon begins what will be a nearly 30 minute speech, the meat of his tour, describing the ancient life here at Cliff Palace. 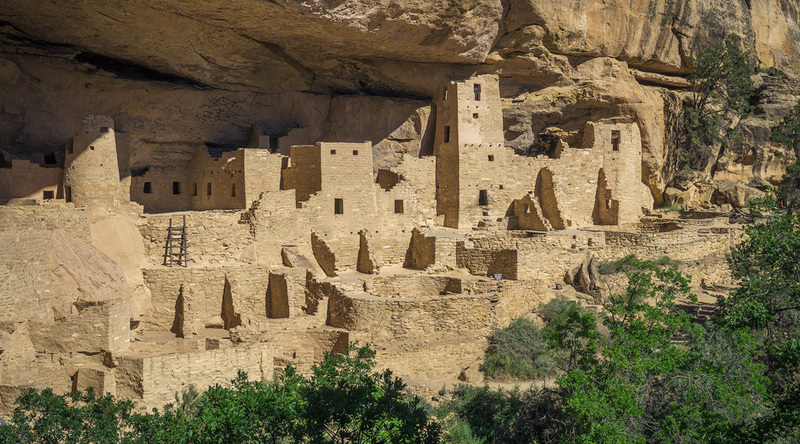 His take is quite refreshing, dispelling the myths and misinformation previously told at Mesa Verde, and presents what he calls a “critical history” of Cliff Palace. He emphasizes the fact that there are so many things we don’t know about the people that lived here. We are only left with a few clues. Many clues we may have had were stolen long ago by looters that raided the pueblos during the early American settlement of the Southwest. Hanging out under the alcove. I won’t reveal much more about our guide’s tour. I do not believe that I can do it much justice with my own writing. But let me say this: as tour guide myself, I had much respect for how Ranger Aragon conducted his tour. Giving a tour for a public is always walking a fine line, especially for an NPS ranger. As is standard operating procedures for the NPS, he focused fact-based reasoning that is often unpopular with the general population. But Ranger Aragon also took some risks. He pushed his guests to think about Cliff Palace, its inhabitants, and the desert Southwest as a whole in a progressive way. But he also voiced some opinions that might rub you the wrong way if you are the type that swears by Fox News and the like. Yet, it is important for experts in the sciences to push the world forward, no matter how many feathers get ruffled in the process. Keep doing what you are doing out there, Ranger Aragon! We need people like you out there to help open the eyes of public to the pressing matters that effect our National Parks and wildlands! Ranger Aragon speaks the gospel. After doing a masterful job of fielding a few questions, the ranger led us a few steps down to the base of Cliff Palace’s towering structures. He continued his explanations of the ancient ruins, and we were awed and their construction. Coming from our modern generation immersed in technology it is almost unbelievable to imagine people living in this harsh landscape. In our world, we rely on grocery stores for food and utility companies to heat our homes and supply our water. In the Puebloan world, these things were only brought through what could be squeezed out of desert using their own blood, sweat, and tears. After a stop in the shade, Ranger Aragon leads us up to have a glimpse at one of the many kivas, round structures that were once underground, but have been exposed as the walls have fallen over time. As we enjoy the ranger’s final remarks, the details of the construction in these walls truly reveal themselves. This place really is palace. The architecture primitive, yet so intricate. In the largest cliff dwelling in North America, the smaller details are as amazing as the grand vista. Ranger Aragon leaves us with one final piece of wisdom. Something profound that I feel obligated to translate from his words to my own. For the people that lived at Cliff Palace, water was rare and precious. They choose to live here because of the tiny spring, called a seep, that trickled out of the back of the alcove. This allowed life to thrive in a harsh, unlikely environment. Yet the Puebloan people knew they must be careful with every drop. Contrast this with our modern Southwest, where we ignore the fact that we have too many people, not enough water, and not nearly enough care given to how our water is used. Ranger Aragon next to a kiva as Cliff Palace sprawls behind. After our trusty guide finished this tour, it was time climb up and out. We are greeted by another stone staircase weaving up a notch in the rock. It’s a single file line to get out, and it screeches to halt. From the view at the rim an hour earlier, we remember watching people ascend an 8 foot high latter to get. That must be where the problem is, but a minute or two later we are moving again. I don’t think my wife enjoyed it much, but it was a simple climb up and we were back to the car! I purposefully left out a lot of the historic and factual details of Cliff Palace for a reason. I think it needs to be seen and experienced in person. Furthermore, the “story” should be told by someone like Venacio Aragon. If you go to Mesa Verde National Park, I think that the Cliff Palace tour is a must do! It’s only $4 per person for the one-hour tour. It’s well worth it. You will walk away with a much better understanding of Publoan culture and the hardships of life in the ancient world. Also, do yourself a favor when you buy your tickets and request a tour with Ranger Aragon. Tickets for the Cliff Palace tour are $4 per person and may be purchased the Mesa Verde National Park Visitor Center. Upon ticket purchase, the ranger will provide directions to Cliff Palace, along with park maps. Park Entrance Fee: $15.00 per car Memorial Day to Labor Day and $10.00 per car for the rest of the year.